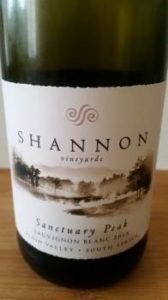 The Sanctuary Peak Sauvignon Blanc 2015 from Shannon Vineyards in Elgin was among the 20 finalists in the recent FNB Sauvignon Blanc Top 10 competition but was ultimately not a winner. Let that not deter you – it’s an absolute cracker. Made by Gordon and Nadia Newton Johnson, the wine includes 8% Semillon, spontaneously fermented and matured for three months in French oak, 100% new. There are top notes of fynbos and a talcum powder-like dustiness on the nose before pear and white peach, a hint of black currant and a little gun smoke. The palate is very pure, the fruit definition excellent. This is a substantial wine without being weighty or too thick textured and really detailed, so rare when it comes to Sauvignon Blanc. The finish is long and dry, a little extra tug provided by select parcels undergoing a period of skin contact. Price: R100 a bottle. Where can we spurce this wholesale for our hotel?